ceremonies - hire products to make your special day outstanding. ideas for outdoor or specialist ceremonies. chairs, chair covers, gazebo, urns and plinths. 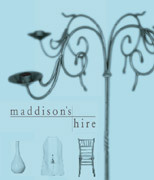 Maddisons double damask linen is of the highest quality. Napkins also available in most colours. A small cross-section of our table decorations. To view our full range of hire decorations, call the showroom and arrange a time.